On the eve of former Housing Director Deb Wilson’s pre-trial examination, the Ferndale Housing Commission looked at several of the issues that have come to public attention along with the obvious upheaval of her arrest and resignation. Among the issues came announcement of the settlement of two lawsuits, a significant change in a policy for issuing HUD vouchers, revisiting the budget that was hastily approved in December, approval of the annual audit contract, and a cordial rundown of concerns that had been brought up by residents at the December meeting. Also, it was announced that HUD would be coming in to review the program. Wilson was arrested on Nov. 3 at the Withington Apartments, and police say she admitted going into resident’s apartments and swapping their prescription narcotics for over-the-counter pills. Rather than firing Wilson, the Housing Commission allowed her to resign and has instructed their attorney to negotiate a settlement to Wilson in compensation for ending her contract early, back vacation pay, sick days, etc. Attorney Justin Smith updated the Commission on the case, stating that Wilson would have a pretrial exam on Jan. 22, and that it is not yet known if Wilson would accept their settlement offer. Based on her contract, Wilson could be entitled to half a year’s worth of pay and benefits, as well as owed time. Smith is acting on the Board’s behalf to facilitate the settlement, and any settlement agreed to would become public knowledge once the deal is done. Board Chair Don Wiggins spoke about the upcoming review, stating that he understood concerns people had with the policies, and noting that HUD would review them and let them know if any were made in error. “We are looking forward to their suggestions,” he said. One of the more visible matters has been the series of protests in front of Withington, which is the apartment building where the program offices are and where Commission meetings are held. The protests began with Charmonique Hopkins, a mother of four living on Desoto in Detroit (near Livernois and Fenkell). Hopkins had received a housing voucher through the Commission for six years. But then in April 2014 a contractor for the Commission went to do an inspection and saw a vacant home in the same block at Hopkins. Under the Commission policy, vouchers cannot be issued to homes on the same block as a boarded up home. 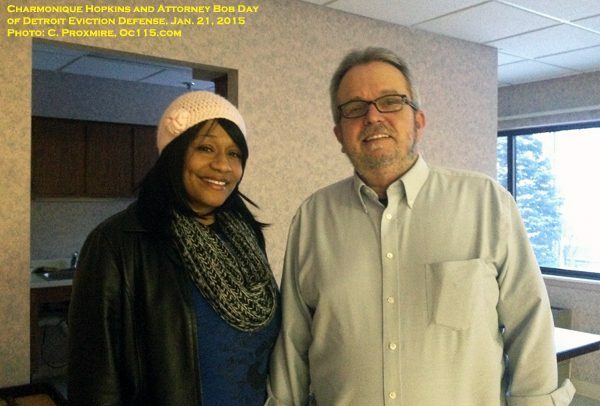 Hopkins received a notice that she would have to move, or give up her voucher, and after getting nowhere with the Commission or the administration she got Attorney Bob Day of Detroit Eviction Defense involved. Day said that he could not get any response from the Commission and had been refused the opportunity to speak at meetings because the Commission did not provide time for public comment. Day began working on a case to take them to court, as well as organizing the protests. Another similar situation came to light because of the protests. Another single mother, Theresa Benton had lost her rental home and found herself with nowhere to go after inspectors noted a boarded up house nearby. Benton was determined to stay in the area so that her daughter, a high school junior, could continue school and graduate from Cass Tech. In Hopkins’ case the landlord had been willing to let her stay pending the litigation. In Benton’s case, she was not able to stay and had to live with relatives. In both cases, the Commission voted to reinstate the vouchers. Hopkins was granted back rent and utilities, and in Benton’s case her previous rental property is available and she is able to move back in. The settlements were made possible only by changing the policy that had prevented them from qualifying for the vouchers. The policy of not being near boarded up homes is a specific policy created by the Ferndale Housing Commission to clarify a vague HUD requirement that homes not be in an area where the “site and neighborhood condition that poses a threat to health or safety.” Because the Federal policy is so broad, HUD determined that each local authority could make their own site requirement policy, but that it had to be specific and included in their administrative plan. Previously Wilson had claimed that her hands were tied by the HUD polices, but in fact there was a path to change. And the Housing Commission took that path by repealing policy 8.1.B in their administrative plan. After several months of protest and media attention, the Commission listened, and seemed to embrace the open dialogue finally taking place. Chairperson Wiggins explained that polices like those requirements are meant to provide guidelines to keep residents safe and were not intended to cause problems. “Forgive us for our exuberance,” he said. “The policy was trying to do the right thing, and make sure people had a safe place to live. But it created a barrier.” By removing 8.1.B, the administration then defaults to the general HUD rule, which has more flexibility. The decision will make it easier on families that live in areas where boarded up homes are common, and it will also save the program money. “Frankly if we keep getting lawsuits based on this policy, it’s going to really bog down the staff and increase legal expenses,” Attorney Smith said. The Housing Commission recently began having public comment at their meetings, and though not all residents feel comfortable speaking up, the path for it is becoming more clear. Chairperson Wiggins noted that in meetings past there would only be enough people to fit in the front row. For the past few months, the room has been full. Emily Vickey, who worked with Wilson prior to stepping in as Acting Director, went through a list of concerns. She stated that the Community Room in Autumn House and the main level Community Room in Withington had been re-opened for residents to use. The upstairs Community Room in Withington is still locked, but she is looking into making it available again. Vickey also stated that she was working on getting resident meetings going again. One concern that residents had was feeling like security cameras were not being watched. Vickey explained that there was not enough staff to review the tapes, but that if people complained about specific incidents she could check the tapes. She also said that if people see activity they feel is not right after office hours, they can call the Ferndale Police. “The list Emily just went through is in response to your comments here and in writing we do want you to know that we appreciate it,” said Chairperson Wiggins, who took care through the meeting to explain things and thank people for being part of the process. “This is how democracy works,” Wiggins said. In December the Housing Commission approved a budget without sharing it with the public, or even taking time themselves to really consider what was in it. They had adopted the budget quickly to meet a HUD deadline, and had been under pressure with the changes taking place since Wilson’s departure. “We passed it without looking at it thoroughly, with the intent of going back to it,” Wiggins said. Commissioners discussed the budget in more detail, with the accountant present to answer questions, with little being of interest other than increases in the cost of utilities which could be a strain moving forward. Each year the Housing Commission hires an auditor to go over the finances, which is a HUD requirement. The contract was awarded to John C. Depiero, who has done this for at least ten years, Vickey said. While the contract is put out to bid, Commissioner Ryan Hertz questioned the process. Vickey had sent the opening out to four companies, but only Depierto is in the State of Michigan. His bid of $6,600 was accepted, with the only other bid being from Florida and including travel expenses, making that bid $12,000. Hertz questioned why only four bids were sent out and why three were sent out of state, and the response was that was how it had been done in the past. Hertz voted for the contract, but only on the condition that Vickey explore other potential avenues for next year. “After a period of seven to 10 years it’s a good practice to change auditors,” he said, noting that he trusted Depierto but would like to see a different auditor’s perspective next year. The waiting list for Section 8 Housing will open on Jan. 26 at 9am. Interested individuals can apply online at www.ferndalehousing.com. Applications will be randomly selected and put on a waiting list to be contacted as openings become available. For more on the Ferndale Housing Commission see www.ferndalehousing.com.